I have to admit, I really am not a good cook. Currently, I can make about 10 different recipes and typically they involve smothering everything in cheese. In college, I remember calling my mother to ask her how to tell if the water was boiling so I could make a pot of noodles. So, take my word for it - I'm really not a talented chef nor do I cook often. I'm pretty sure I would live off of potato chips if it wasn't for my wonderful husband who owns a local market and enjoys grilling. That being said, I actually had to learn how to cook a few things when I was nannying, because I'm pretty sure you're supposed to feed small children regularly. The small child's mom, Jemima, is an inspiring cook and taught me this recipe several years ago. She made it for me during the short time I was vegan and even though I am not a vegan now, I still crave this delightful heartwarming healthy soup. The recipe requires few steps and ingredients, but I assure you, it's full of flavor. Butternut Squash (I really like finding the pre-chopped and skinned butternut squash at the store, because every time I try to do it myself, I have a near death experience and then my hands are orange for days). Yellow/White Onion (To be honest, I have no idea what the difference is besides the color difference). **Immersion Blender - This isn't an ingredient but if you don't have one, you need one in your life. You can get one for about $20. First things first- you're going to need to roast the squash. Roasting gives it a nice toasty, caramelized flavor. I set the oven to 350F, rub coconut oil on the squash, and season with salt and pepper. I roast the squash for about 25 minutes or until it is fork tender and lightly browned. While the squash is roasting, I chop up the onion and sauté it in a pan with about a tablespoon of coconut oil. Season with salt and pepper, and when the onion is translucent, turn the heat off and wait for the squash. Pour a glass of wine, do a little dance, sing a song, whatever suits your fancy - you have about 10 minutes. GO! Next, squash comes out and goes into a big pot. Once it's in there, go ahead and throw these other ingredients in there with it: Sautéed onion, coconut milk, vegetable broth, and spices. I typically use 1.5 tbsp. of curry, 1 tbsp. of cumin, and .25 tsp of cayenne. If you are nervous about your soup being spicy, just season to taste. Now it's time to break out the big guns... the immersion blender. It's super fun to use, however, you run the risk of splashing burning hot squash soup all over yourself. Trust me, it's worth it. You could also use a blender, but that's for the weak. Just saying... Anyway, I digress. Go ahead and use the immersion blender until everything is nice and smooth. If you can't tell already, this is my favorite part of the recipe. Since everything in your soup is already cooked, you just need to warm everything up and cook your spices! Turn on your stovetop to medium/medium high heat while stirring occasionally - I don’t think it really matters; everything is cooked, so it depends on how much time you have until dinner is supposed to be ready. They say slower cooking allows for more flavor development, but I don't know that I could tell the difference. When your soup is hot and steamy, ta-da! 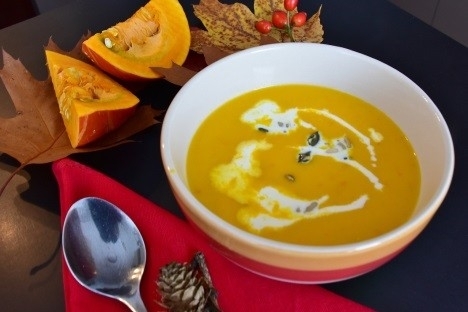 Your healthy vegan coconut curry butternut squash soup is ready! Serve with truffle oil on top or toasted pumpkin seeds, or maybe crème fraiche or bacon for you non-vegans out there. That's it for me folks. Enjoy!